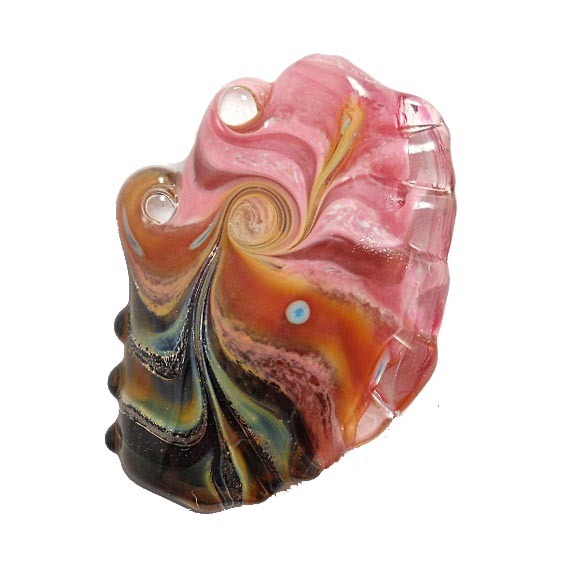 Here’s a rundown of the enamels I use for making lampwork glass beads, such as it is. I don’t actually use all that many colors. I have tried a few others, but these are the ones I’ve settled on. I like enamels because they give nice, clean colors with none of the problems you can run into with glass rods. No devit, no mud, no worries! 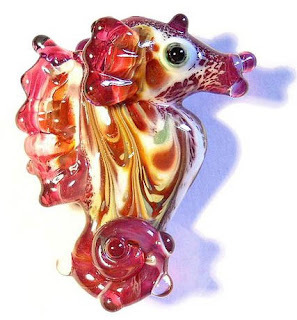 I also find them essential when I’m trying to duplicate most types of designs from nature~ I always use them as part of my seahorse patterning. I wrote a blog about an experimental bead of that sort a while ago, trying to imitate a natural pattern. My camera ran out of gas in the middle of the experiment, so there are no pics of the best part, but you can get an idea of what was done, anyway. Here are links to a few articles on this blog that talk about enamel use. I’m still not really sure about the edp trick, but it’s worth further exploration. Here are the colors I use, and why! * Bright red (9840)~ great for a nice, stable red red. If folks ask me for something red and I am thinking clearly, I virtually always use red enamel. * ‘New’ purple #9740~ a nice, clean purple. Dark purple is OK, but this reads more true to me. * Light or dark orchid(9760 or 9780)~ wonderful pink either way~ also essential. I don’t know if I can tell one from the other. Reacts nicely with raku and iris gold frit.Also lovely with a line of rubino running through it. * Oxford blue (9650). There are several blues that are all very similar. Medium blue or blue green are OK, but I prefer oxford. There is also something called just 'aqua' I think which is quite nice. * Transparent aqua( might be #9452)~the only transparent I really want to have around. It’s a nice light aqua blue, not dark like all of the ones mentioned above. Probably best backed with white enamel. * Melon yellow (9830)~ kind of halfway between orange and yellow. I’m not a big yellow fan, but I do like this color. * Green~ I’m pretty sure it’s apple green (9330) that I like. Moss is a bit too grey and dark for my taste. I have not tried orange red (9835) but it looks intriguing. NOT black. I’ve gotten it and it just seems to turns kind of dark grey and takes over. Then again, maybe some folks know what to do with it!